This is a long awaited post.. 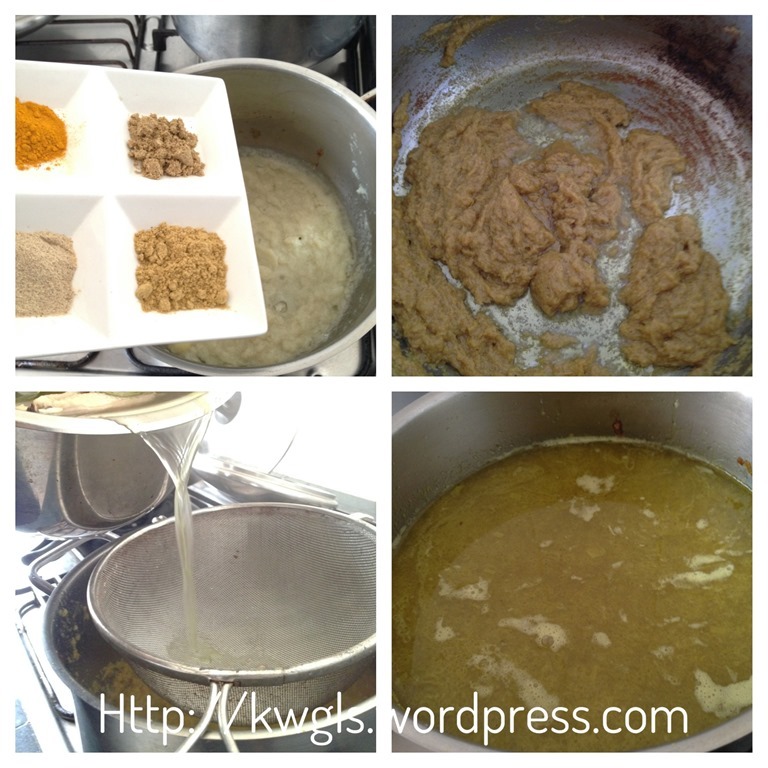 I have prepared the dish on 30-9-2014 but only have a chance to issue the recipe today. 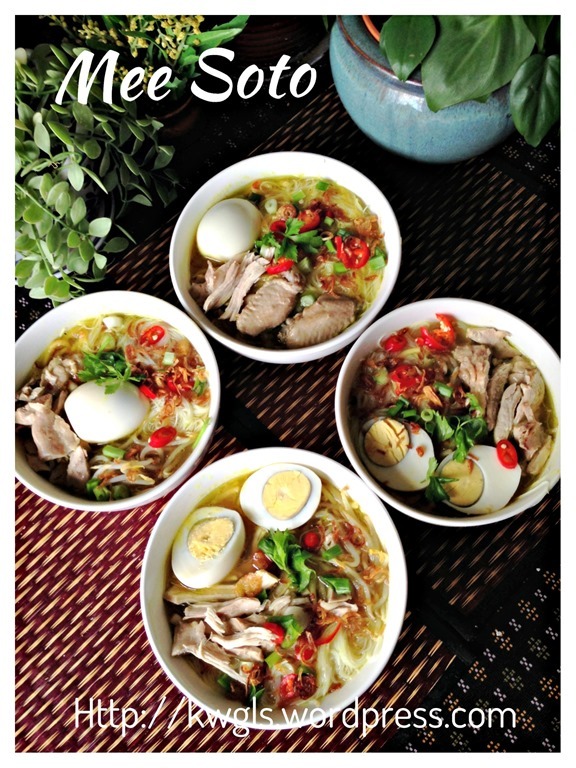 Reader and Facebook group members are chasing me for this recipe and I promised them I will issue as soon as possible. At times when I am busy, it is very difficult for me to concentrate to issue a savoury post with lots of ingredients and procedures… Today is the day when I am a bit of free time, can sit down and concentrate to write the recipe for all. 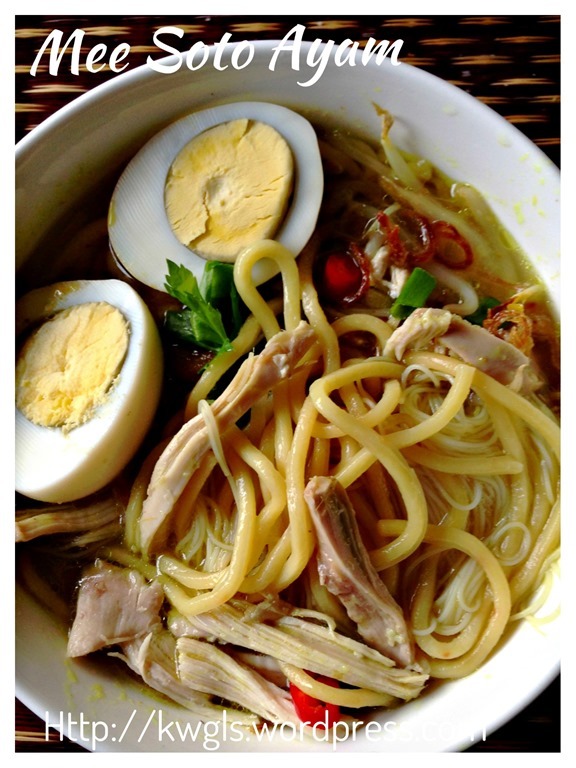 This is one of the Malay noodles that I occasionally ordered when I frequented Malay stalls… Of course, I have to order Mee Soto Ayam or Chicken mee soto.. 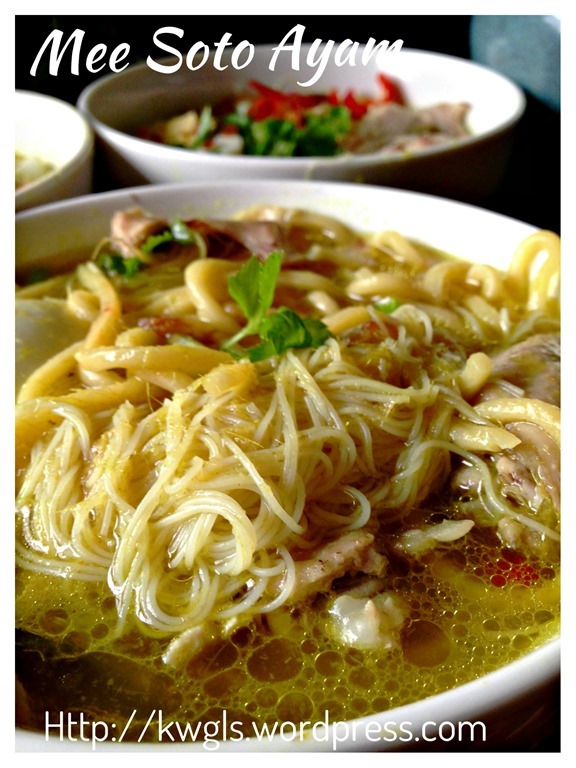 It is a turmeric and other spice based soup, slightly clear yellowish soup and served with shredded chicken (or chicken chunks) on top of a bowl of rice vermicelli or yellow noodles… Some may also have side items such as begedil to go with it. If you are interested, you can refer to this post: Deep Frying Your Potato Patties ?–Begedil (炸马铃薯饼）. However, for this illustration, I did not prepare begedil to go with the mee soto. 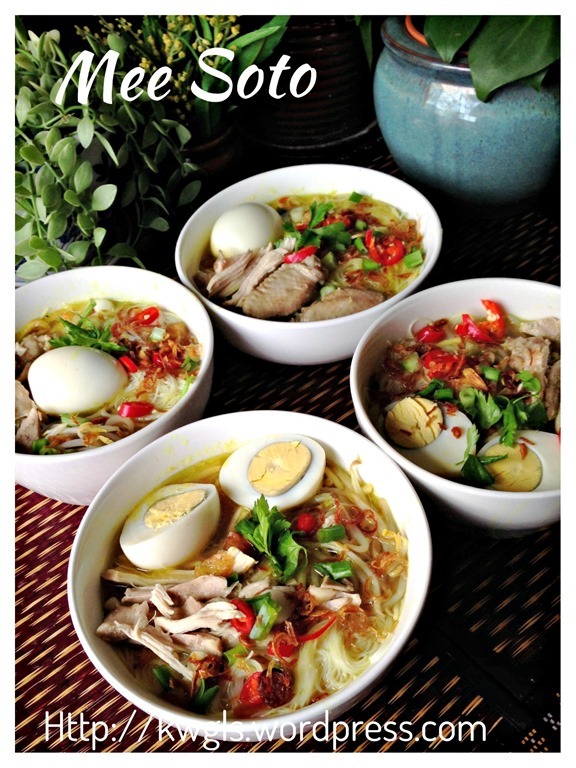 “Soto mie, Soto mi, or Mee soto is a spicy noodle soup dish commonly found in Indonesia, Malaysia, and Singapore. 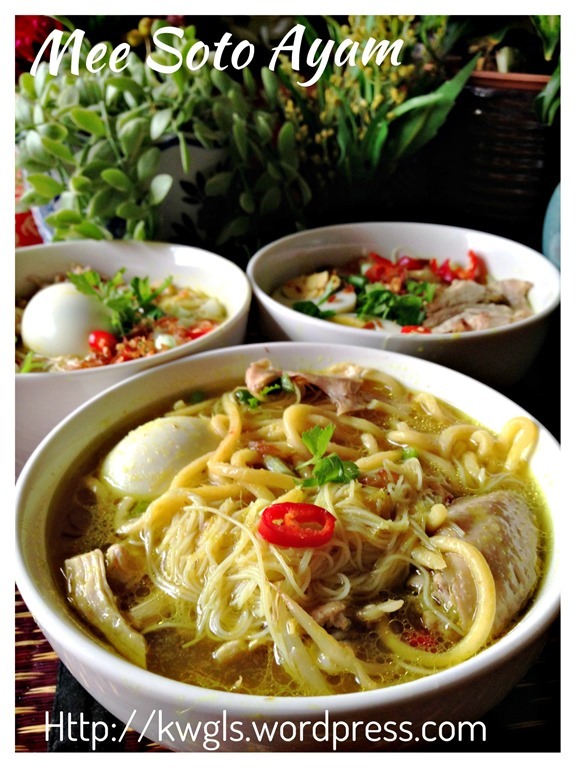 Mie means noodle made of flour, salt and egg, while soto refer to Indonesian soup. 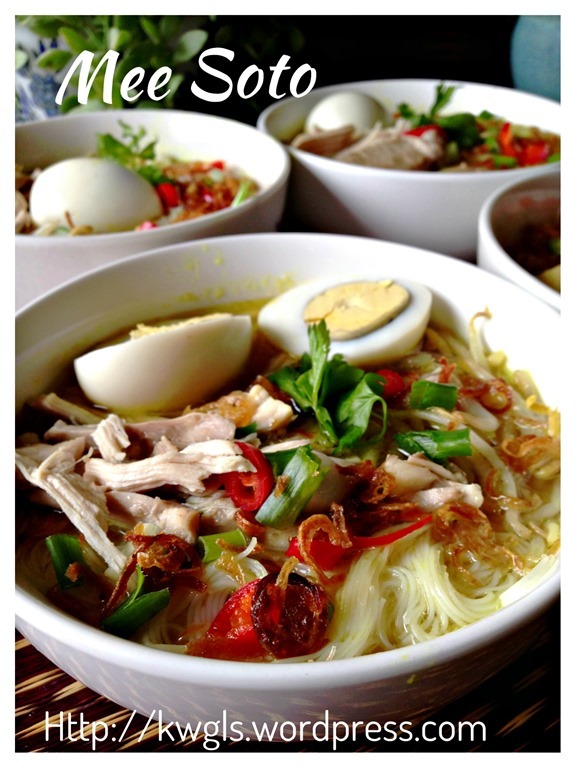 In Indonesia it is called soto mie and considered as one variant of soto, while in Malaysia and Singapore it is called mee soto. 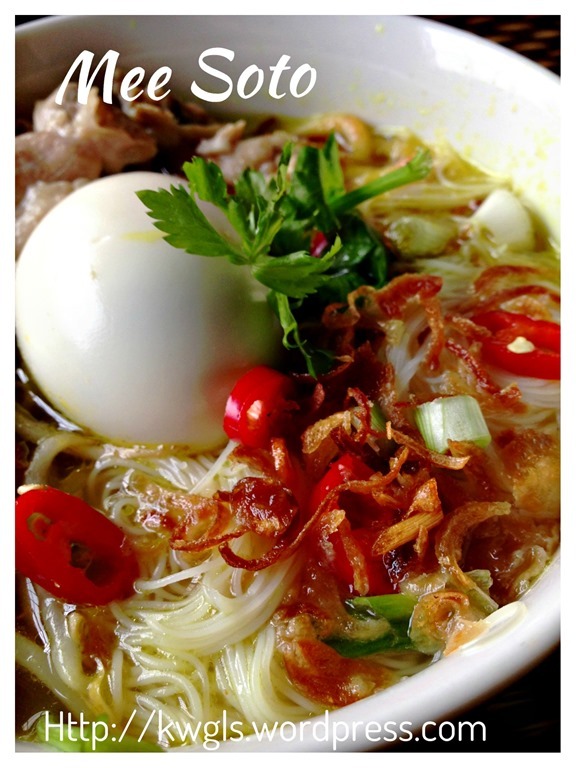 There are some variations of soto mie, it can be made of beef, chicken, or offals such as kaki sapi (cartilage and tendons of cow’s leg) or tripes. 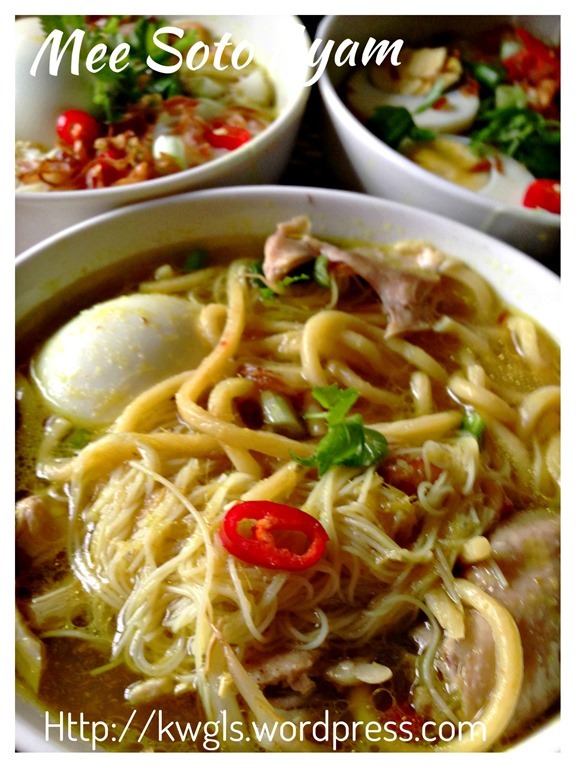 People may exchange noodles for rice or rice vermicelli according to their preference. 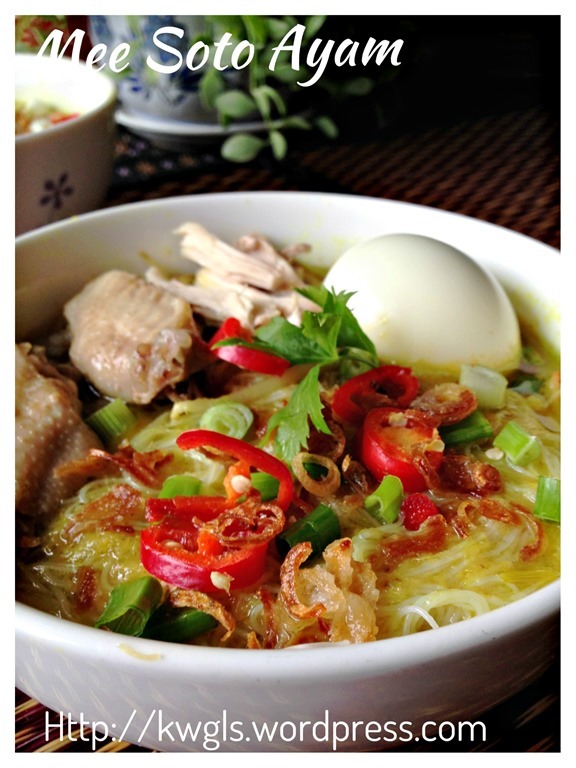 A combination of either noodle or rice vermicelli along with slices of tomato, boiled potato, hard boiled egg, cabbages, peanut, bean sprout and beef, offal or chicken meat are added. Broth is then poured over this combination. This soup is made from beef or chicken stock and some other spices. 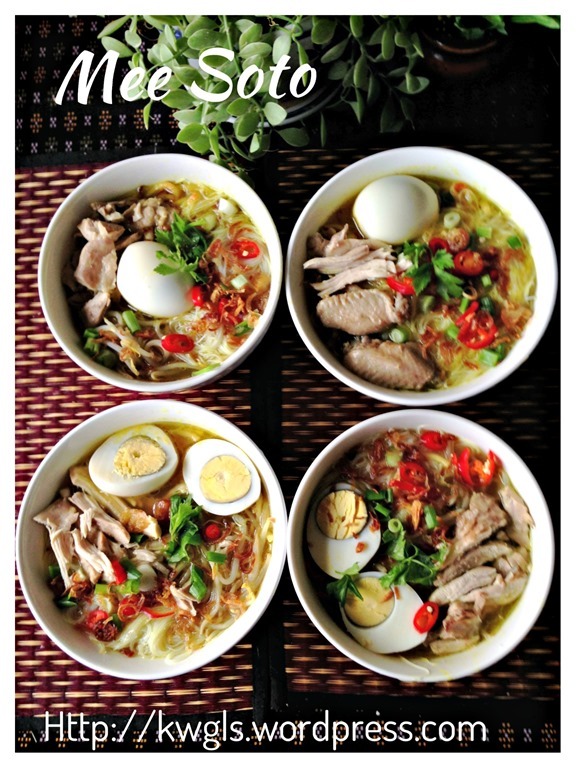 Soto mie usually add condiments such as jeruk nipis (lime juice), sambal, bawang goreng (fried shallot), vinegar, kecap manis (sweet soy sauce), and emping. 1 small to medium sizes chicken– cut into 8-10 pieces. 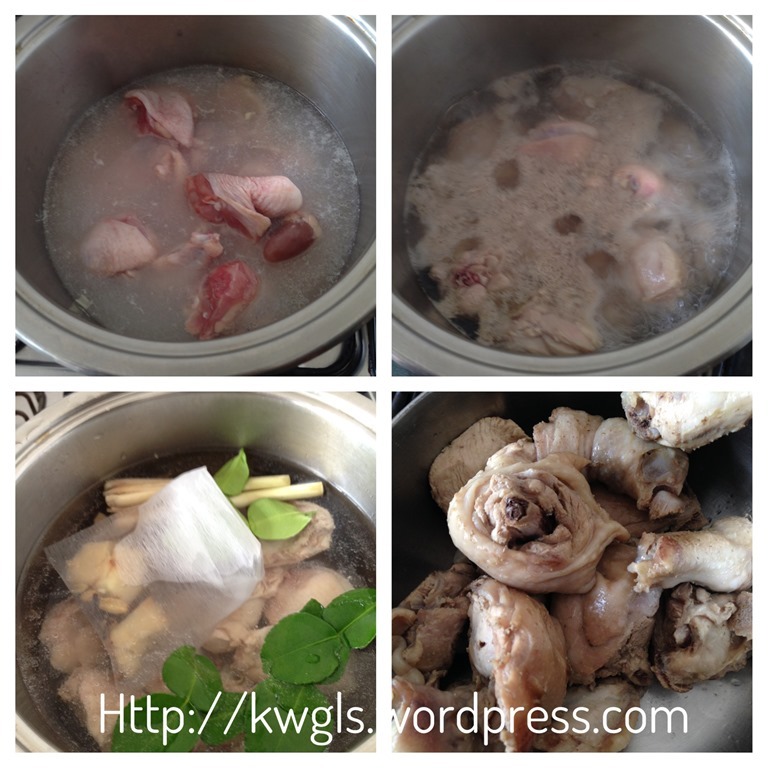 In a big pot, put some water and blanched the chicken to get rid of the blood. As long as the exterior is slightly cook, off the heat and throw away the water. Slightly rinse the chicken to get rid of any blood clot. 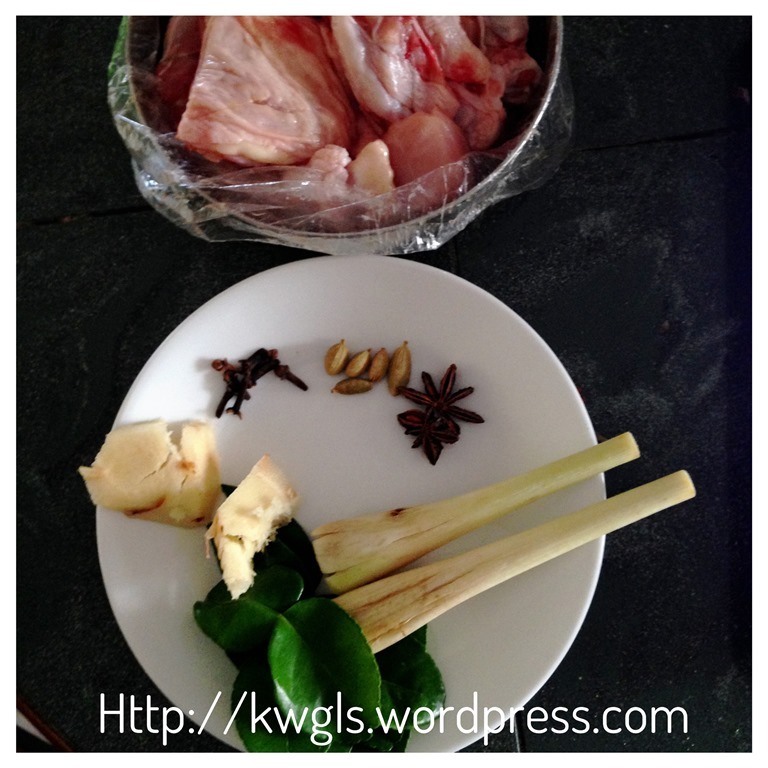 Add about 2 litres of water, lemon grass stalks, lime leaves and other spices such as cloves, cardamoms, star anises . I have put all these small items in a soup bag. Bring the water to boil. 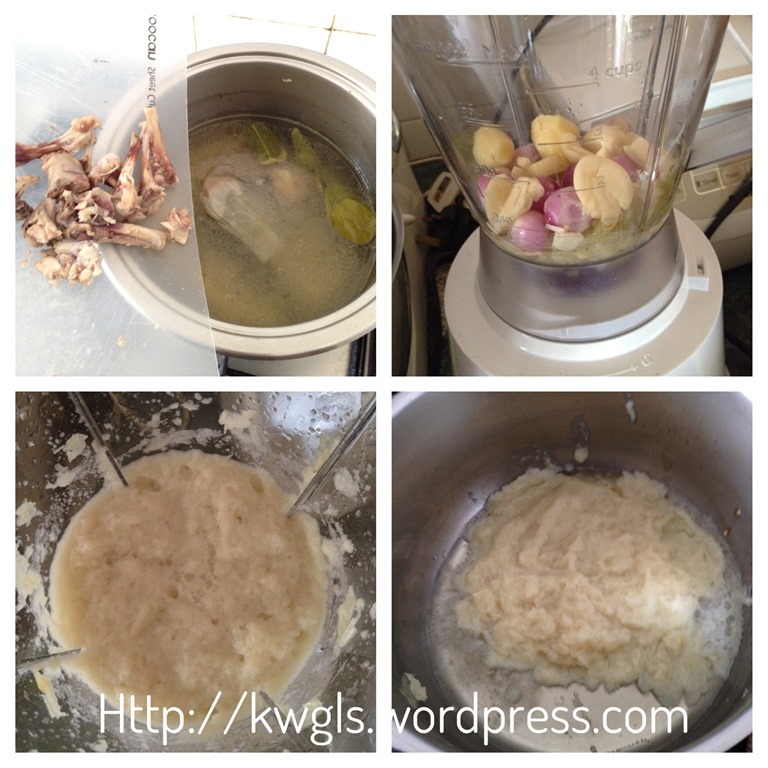 Once boiled, reduce the heat to medium, let is simmer until chicken meat is tender. Dish out the chicken and set aside for later use. When the chicken is cooled, debone the chicken, throw back all the bones into the soup and you can simmer again until your rempah or spice paste is ready. If the water is getting less and less, you can add in more water. If you preferred, you can also add in chicken carcasses to get a more concentrated chicken soup base. It took me about 30 minutes to get ready the meat as I am simmering it under low to medium heat. 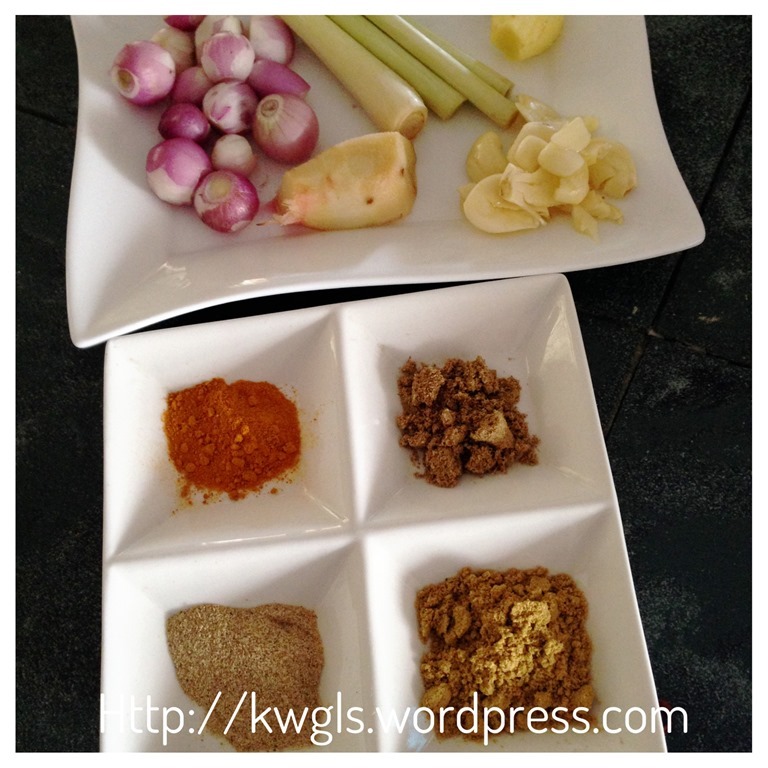 In a blender, put all the rempah or spice mix ingredients in a blender (except the powdery spice). Add adequate water just to cover the herbs. Blend until fine. Set aside for later sautéing. In a big pot, add 2 tablespoons of cooking oil, sauté the spice mix until fragrant and aromatic. It may take about 10 minutes or so under medium heat. Add the powdery spice and stir fry for another 2-3 minutes. Sift the chicken stock from another pot to this pot. Bring the soup to boil. Add seasoning (salt, light soya sauce and sugar to taste), off the heat and set aside for later assembly. 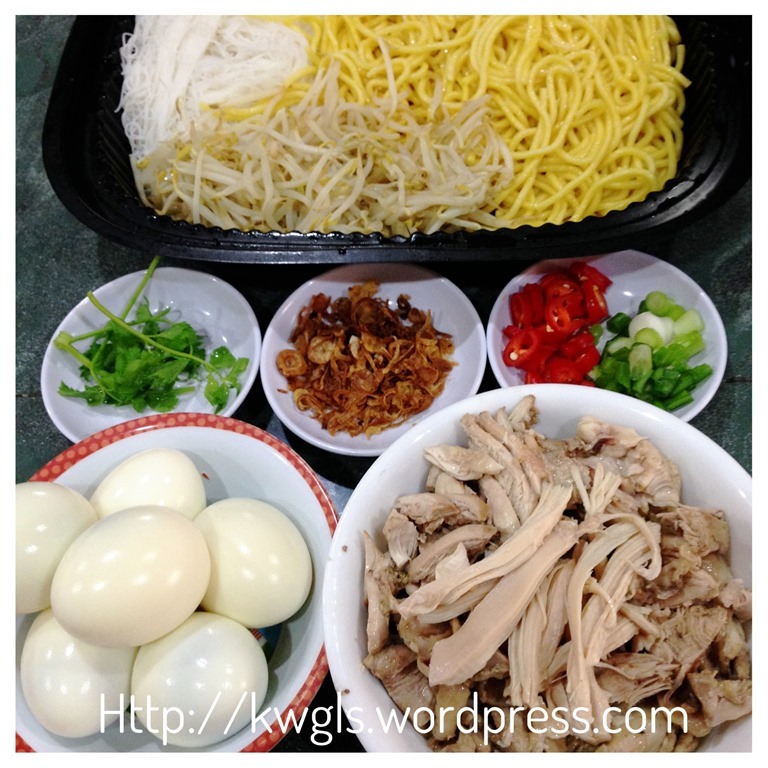 Before assembly, you should have the following ingredients ready: blanched rice vermicelli, blanched yellow noodles, blanched bean sprouts, shredded chicken, hard boiled eggs, chopped chilli, chopped coriander or Chinese celery and deep fried shallots. 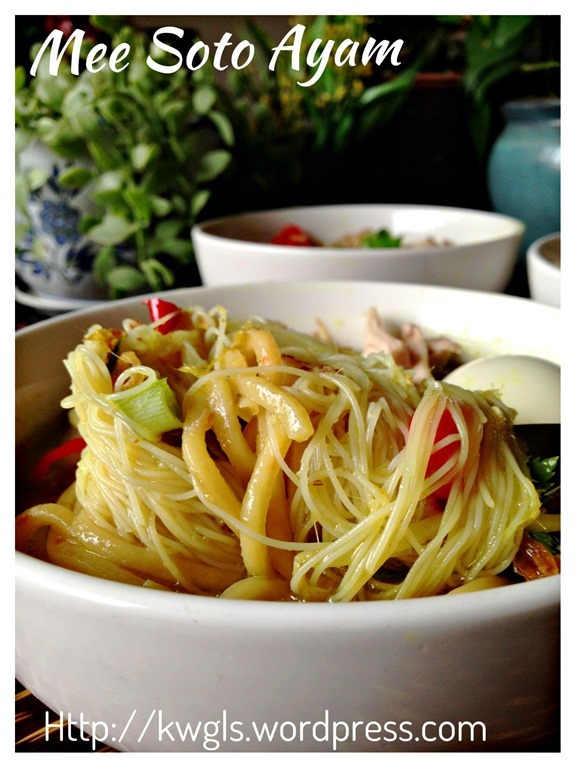 Have a bowl, put some bean sprouts, yellow noodles and rice vermicelli. Pour soup adequate to cover the noodles. On top of the noodles, put eggs, shredded chicken meat (or chicken chunks) , begedil (if you have) and garnished with chopped chillies, chopped spring onions, Chinese celery leaves and deep fried shallots. 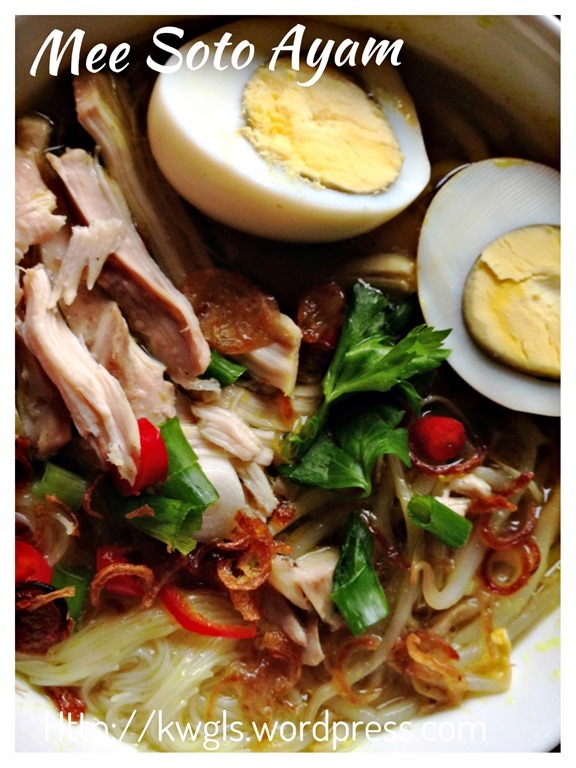 Best served warm with sweet soya sauce or kicap manis. For this dish, list of ingredients is rather long. However, just remember a few critical spices and herbs that bring out its unique flavour. These are lime leaves, turmeric powder or fresh turmeric and galangal. Of course all the others are important but without these three, it will be not much different with other spice based noodles dishes. Do give it a try and let me know if it suits yours taste buds. 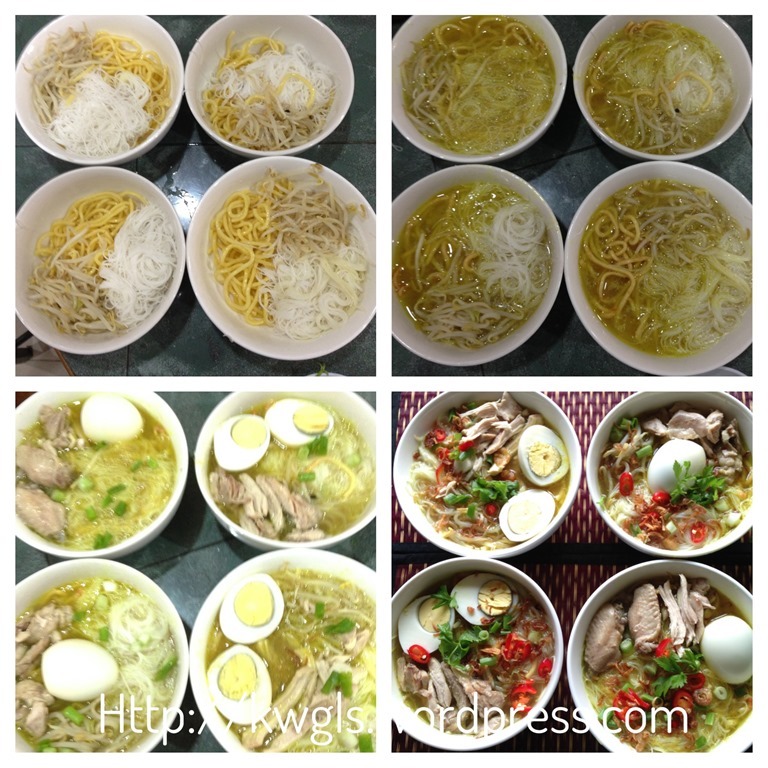 This entry was posted in Food Preparation Series, Noodles, Rice and Others and tagged 8, 马来鸡汤面, GUAI SHU SHU, Guaishushu, kenneth goh, malay noodle dishes, mee soto ayam, Mie Soto, postaday, Soto Mee. Bookmark the permalink. Just dropping by to say that I’m in awe of your talent! You can cook & bake so well! Thanks for graciously & generously sharing your recipes. Your family is truly blessed to have you!